This little pot of pasta is a quick and healthy weeknight dinner you can whip up in 30 minutes. It’s a great option when you want something fresh and substantial with minimal effort that relies on the pantry and freezer for ingredients. I had fresh broccolini spears waiting for use in my fridge and dipped into my stash of sausages I keep on hand in my freezer, because, well, one should always have a stash of sausages in the freezer. A can of Italian plum tomatoes and a box of pasta later, voila, we had a meal for 4. Bring a large pot of salted water to a boil. Add pasta and cook until al dente, about 9 minutes. Drain and transfer to a serving bowl. While the pasta is cooking, heat 1 tablespoon olive oil in a skillet over medium-high heat. Add sausages and brown on all sides. Remove from pan and transfer to a cutting board. When cool enough to handle, slice in 1/4-inch pieces. Pour off all but 1 tablespoon fat from the same skillet and add 1 tablespoon olive oil. Add broccolini and sauté over medium heat until bright green but still crisp, about 1 minute. Add garlic and red pepper flakes and sauté until fragrant, about 1 minute. Add tomatoes, salt and pepper. Cook over medium heat for 5 minutes, breaking tomatoes apart with a spoon. Return sausages to the skillet. Stir to combine and cook until thoroughly heat through. Remove from heat and pour over the pasta. Add basil and cheese and toss to combine. Serve immediately garnished with extra cheese. 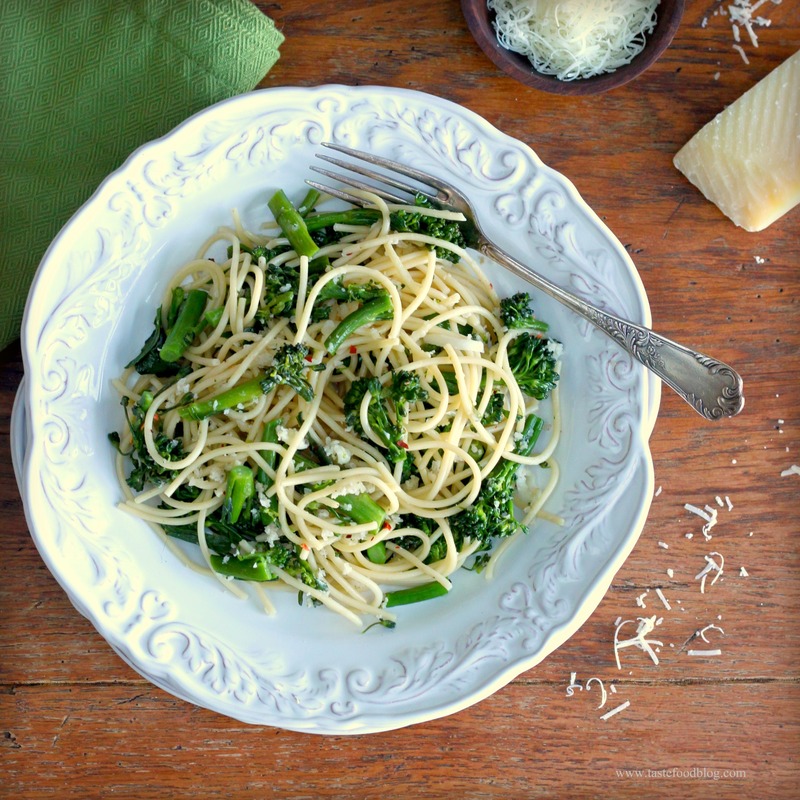 For a fresh and easy weeknight dinner, try this recipe for Spaghetti with Broccolini, Chili and Breadcrumbs. The combination of pasta and breadcrumbs is eternally comforting, like a well worn cardigan you pull on at the end of the day. In this recipe that homey pairing is jazzed up with a potent blend of garlic, red chili flakes and black pepper that will get your tastebuds dancing. Just because it’s the weeknight doesn’t mean you can’t have a little fun. Toast the breadcrumbs in a dry skillet over medium heat until light golden. Sprinkle with 1/2 teaspoon salt and 1/2 teaspoon freshly ground black pepper. Transfer to a bowl and set aside. Bring a large pot of salted water to a rolling boil. Add spaghetti and cook until al dente. While the pasta is cooking, heat olive oil and chili flakes in a deep skillet over medium heat. Add broccolini, garlic and 1 teaspoon salt. 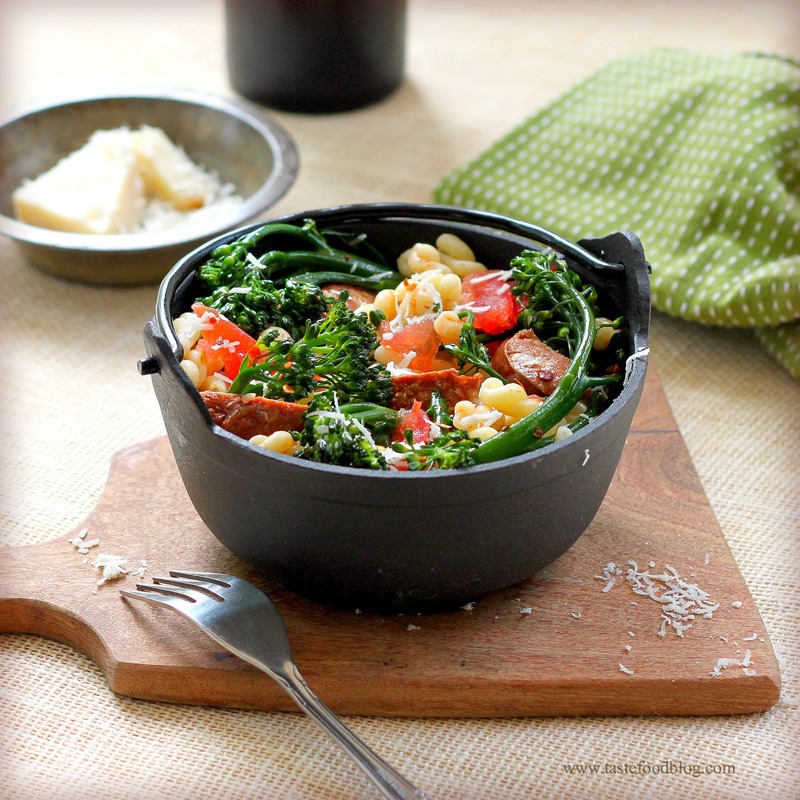 Saute until broccolini is tender and bright, 3-4 minutes. Drain the pasta, reserving 1 cup of the water. Transfer pasta to a large bowl. Add broccolini, half of the bread crumbs and 1/2 cup grated cheese. Toss to combine. If the pasta is too thick add a little reserved water to desired taste and consistency. To serve, sprinkle with remaining bread crumbs and cheese, to taste. Garnish with freshly ground black pepper. Light, fresh and bright, this dish sings spring. 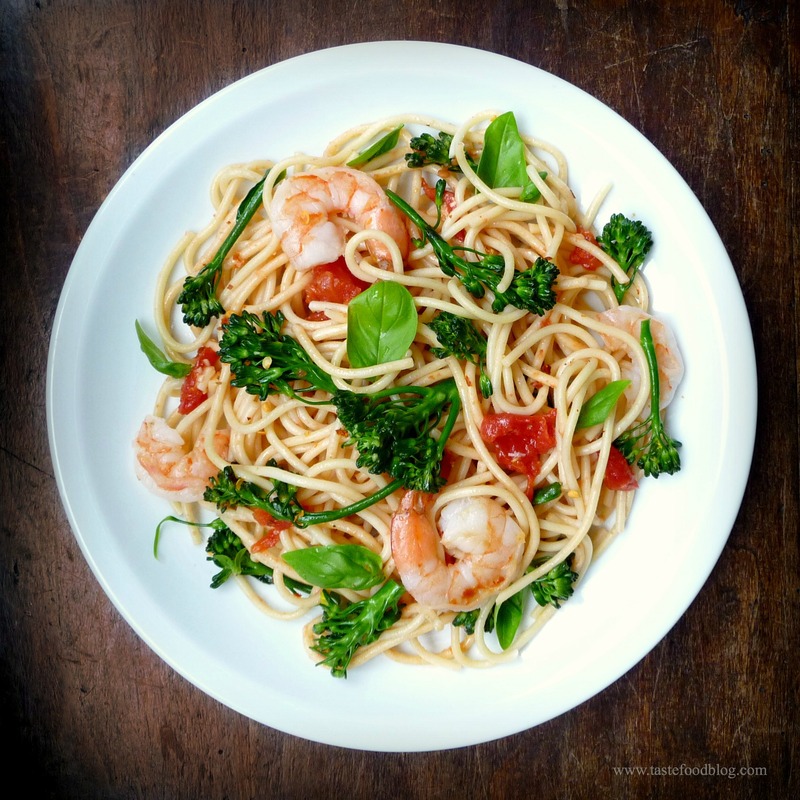 Shrimp, broccolini and plum tomatoes have a turn in a skillet with a little olive oil, garlic and crushed red pepper. All the ingredients are united in a bowl with spaghetti and fresh basil leaves, then tumbled with freshly grated Parmigiano-Reggiano cheese. I am thinking of Italy – are you? Bring a large pot of salted water to a boil. Add spaghetti and cook until al dente. Drain and return to pot. While the pasta is cooking, heat one tablespoon olive oil with 1/2 teaspoon chili pepper flakes in a skillet. Add shrimp in one layer. Cook until pink on both sides and just cooked through, 2-3 minutes. Transfer shrimp to a plate. Add one tablespoon olive oil to same skillet. Add broccolini and sprinkle with one teaspoon salt and a pinch of red pepper flakes. Sauté until crisp tender. Transfer broccolini to another plate. Add one tablespoon olive oil to skillet. Add garlic and sauté until fragrant, 30 seconds. Add tomatoes, one teaspoon salt and one teaspoon black pepper. Simmer 5 minutes, breaking tomatoes apart with a spoon. Return shrimp and broccoli to skillet and toss to combine. Remove from heat. Add to spaghetti. Add cheese and basil and toss to combine. Serve with extra Parmigiano-Reggiano cheese.